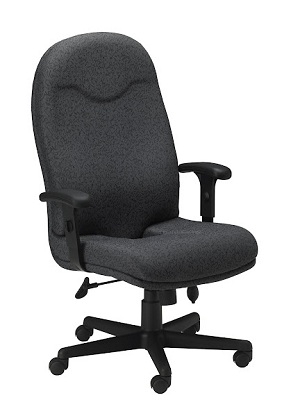 The Executive High Back Chair has a tailbone cut-out in the seat cushion. There are tilt, tilt tension, and tilt lock controls. It has a High back with waterfall seat design, with a one-piece seat frame construction. The T-shaped arms are height adjustable and have comfortable impact resistant urethane arm rests. The Seat Height is 19" at its lowest and 23" at its highest. Tailbone cut-out in seat cushion. Tilt, tilt tension and tilt lock controls. High back with waterfall seat design. The Seat Height is 19" at its lowest and 23" at its highest.